A quality pilot Tube is a must have for any fireplace owner. Using this helps you keep your fireplace lit and working properly. We made sure to make ours very durable so you don't have to worry about it and it's extremely easy to install! You may also notice sore cheeks from constantly smiling about your new fireplace parts purchase! This is a generic product designed and engineered to fit perfectly. This is not a Monessen® OEM product and is not covered under any Monessen® manufacturer's warranty. Please check your manufacturer's warranty with regard to the use of non-OEM parts. 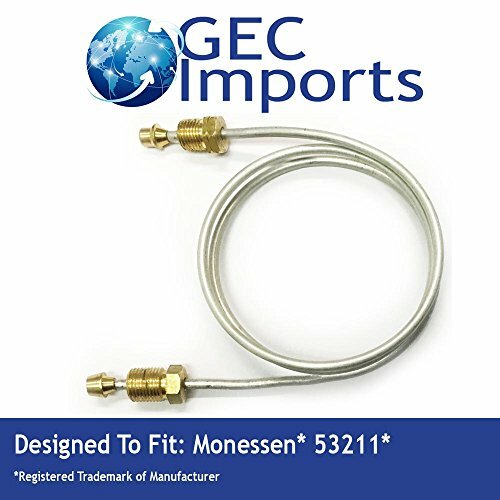 GEC Imports provides no warranty or guarantee with regard to the product or its compatibility with your Monessen® product. Any use of GEC Products non-OEM products in your Monessen® product is done at your own risk. The Monessen® brand names and logos are the registered trademarks of their respective owners. Any use of the Monessen® brand name or model designation for this product is made solely for purposes of demonstrating compatibility. EXTREMELY DURABLE because no one wants a poorly made fireplace pilot tube for their gas fireplace. So we made these as durable as we can and reliable as the originals! "AFTERMARKET" replacement fireplace thermopile (not Monessen®) This is compared to part # 53211. LONG LASTING because when you buy something for your fireplace you don't want to keep replacing it. You want the best quality you can get. Well, now you can! Check your model there lots of different styles out there. GREAT FOR YOUR FIREPLACE! Wether you're using a Monessen® series fireplace or many others you're guaranteed to love your pilot Tube! GUARANTEED SATISFACTION because of a 30 day full money bank guarantee and a trusted GEC Products warranty. We are so confident in our products that we have no problem giving you every penny back if you're unhappy with your purchase. You won't see promises like that from big box brands! If you have any questions about this product by GEC Products, contact us by completing and submitting the form below. If you are looking for a specif part number, please include it with your message.